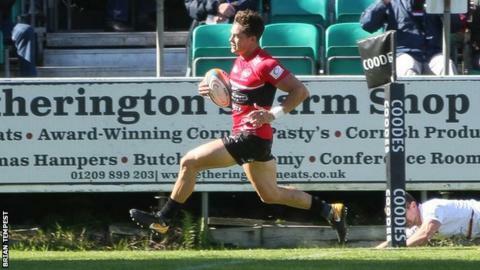 Cornish Pirates coach Alan Paver says his side must stay grounded after winning a fourth successive game. Their bonus-point 29-19 win over Richmond means the club are five points clear at the top of the Championship with a perfect record of 20 points. "Let's not get carried away, we're still a team that have to perform every week," Paver told BBC Radio Cornwall. "We can't just expect to steamroll teams. They do their work, do their analysis, and they want to come at us." Having conceded an early try the Pirates rebounded to lead 22-12 at the break thanks to a penalty try and scores from Sam Matavesi and Robin Wedlake, before Alex Day got the bonus-point try in the second half. "We've got a target on our backs now as a team that are in form and today we were put under pressure," added Paver, who was critical of aspects of their performance at the Mennaye. "We pressured ourselves a lot of the time, we overran it because we've had such success with that, and we went away from our base game around our kicking game, so there'll be a lot to learn from."